This is a Modern , clean, warm and sunny location. Great to unwind and relax with the sounds of the ocean.The rear of the property situated in a private cul-de-sac with easy access to guests car park off the road. The front of the accommodation on Papamoa Beach Road is private and fully fenced, looking across to an open green reserve leading onto a track through the sand dunes. A 2 minute walk to the beach. (Beach towels provided if necessary) Lots of space and freedom. Local attractions include Blue Biyou Restaurant 2km , Surf Lifesaving Club, Papamoa Plaza shopping centre and Fashion Island Shopping mall, BloKart recreation park. Close to Bay Park Speedway and Bay Fair.15 minutes to Mt Maunganui shops and beach also hot pools. The lounge has a 2 and 3 seater recliner suite, in an open plan room with kitchenette, dining table and chairs.Sky TV with unlimited wifi access. North facing the unit is very sunny and warm. There is a washing machine in accommodation. Linen will be provided in tariff (Towels, Beach Towels, Blankets Sheets Pillows). The tariff quoted is for 2 people, however there is a slat fold up single bed with good mattress available, which will have to be located in the lounge and this will incur an extra $30 per night in addition to advertised tariff, linen will be provided. The bedroom has a Queen size bed with lots of room and storage for luggage. Parking is available for one car at rear of property. We are a fun loving couple with a desire to ensure your stay will a memorable peaceful experience.Your comfort and safety is of importance to us and we will ensure this happens.Should you have any requests of us we will endeavor to help anyway we can. Our accommodation has been set up with the customer in mind as our previous experience has been in the accommodation industry. We believe our property can offer you a relaxing stay with comfortable furnishings particularly the Queen bed. The accommodation is situated in a North facing location which lends itself to be sunny and warm all year round. We have deck chairs available should you wish to stay at home or beach towels and a sun umbrella should you wish to go to the beach. Short walk through reserve to beach and a boat ramp is just down the road.Many peaceful evening walks are available should you be that way inclined and Chrissy can give full directions on where to go as she does at least one daily. Our property is a short distance from Fashion Island Factory shopping precinct with many Factory outlet shops, and Papamoa plaza which incorporates an eatery and many more shops. Bayfair shopping plaza is 6.0km away which when finished will be one of New Zealands largest shopping areas. New roading in the area will make travel very easy with new motorways and flyovers. toilet, shower, Toilet in separate room. Bathroom contains hair dryer in vanity drawer. Soaps provided along with tissues. Spare toilet roll located in toilet room and additional are located in vanity cupboard. Approx 200 metres from the South West Pacific Ocean. Looking towards Motiti Island 9.4km away North East from Papamoa. Papamaoa Beach a short walk via the sand dunes approx 200metres from the accommodation. Looking towards Motiti Island 9.4 km away North East of Papamoa. Papamoa Beach looking out towards the South West Pacific Ocean. Small heater is provided during Winter months. If not sufficient please ask for a second one. All sheets pillow cases and blankets provided. Please discuss the length of stay as we replace every 5 days depending on the length of your vist. Is located within the apartment. This a cold wash only machine and we will supply sufficient powder free, for one wash.( 2 washes if used sparingly) for personal use for clothes only please. Parking is available inside the gate to the right. This the designated park for the apartment. The road gate can be closed for additional security at your discretion. We have free unlimited wifi. Please ask for code on arrival or refer to the Black coloured compendium on the table inside the front door. A towel per person will be provided on arrival with a spare located in the wardrobe should it be required. Beach towels are available on request along with a sun umbrella. WiFi code will be supplied on arrival. Is part of the apartment. Small 2 shelf with vege bin and ice compartment. Plunger coffee maker and COFFEE AVAILABLE. Normal Coffee Tea and sugar provided plus 300ml of fresh milk on your arrival. All pots pans Jug and frypan are available. Bowls for cooking Special knives available. Has all the dishes and utensils needed for a 4 person sitting.There are extra utensils available for larger groups. All other utensils are there for cooking including can and bottle openers. We have what is called a kitchenette arrangement. This area includes a sink, hot plate with 2 elements, Microwave and fridge. Dining table is part of the lounge. Meals are NOT provided. The table will seat 4 people please ask for the extra chair if required. Operating instructions contained within the black compendium. Turn both units on using the respective remotes for TV and SKY decoder then adjust channels and volume using SKY remote only. SKY channels available. Please refer to SKY watch magazine for what is available on a particular day. Radio and stereo located on shelf below TV. This unit can play tapes and CD's. Separate unit and can be played on the TV using the AV channel. Please provide your own DVD's. Small lawn beside the apartment. We can supply adjustable deck chairs for seating. At front of apartment over looking green reserve and sand dunes. Outdoor furniture located on front porch and deck chairs on the lawn. Located to the front of the apartment North facing for all day sun in summer. Deck chairs are available for grass area on request. Wheel chairs can be accommodated with a little difficulty. There are no specific ramps provided and there are 3 steps to negotiate before entry in the unit. The shower is a cubical type with a door lip" NOT A WET FLOOR ",. We are located 5km to Bay Arena or ASB Stadium. This facility has speedway most Saturday nights (October to April) along with many other functions and activities.Blokarts are also located at Bay Station within the baypark complex. Refer to GOOGLE for details and pricing..Put in blokarts Tauranga as the search. This was the second time we have stayed here. Very clean and well set up.Very good value for money. Good location. Well equipped little apartment. Very clean. Owner was very welcoming. The amenities mentioned air conditioning, which was not the case, so probably best to correct this. Other than that everything was great. Comfortable bed. Road noise can be a little annoying,, but this is to be expected on a busy road like Papamoa Beach Rd. Highly recommend for a comfy, clean stay. Hi Jaynie..Just noticed your review regarding the air conditioner. Sorry but because Homeaway Webb site is so complicated to set up we inadvertently ticked the box in error. Hope it didn't inconvenience your stay . I could not speak more highly of Chrissy and Marks hospitality. Greeted at the gate by Chrissy, she was so welcoming and made us feel at home immediately. Stunning accomodation with modern furnishings. They were very accommodating with our last min change of plans and had a bed for my son made up on arrival. We needed to check in early due to the time of a wedding we were there to attend and they were more than happy to accomidate us with that also. The premises were very clean and tidy right across the road from the beach. Wish we could have stayed longer, will definitely be visiting again. The property was lovely, convenient to the beach, restaurants, and anything else you need. Host was very accommodating and friendly. Enjoyed our stay very much! We had a great stay in Papamoa Beach (me, my partner and sister in law) visiting family for a night who were staying nearby. The bach was really well equipped, clean and perfect location for us! Chrissy was super responsive too. Would definitely stay again, it was ideal! Lovely guests easy to host. The apartment was left very tidy, we have no hesitation in recommending them and would welcome them back. In our area there are many leisure walks available. 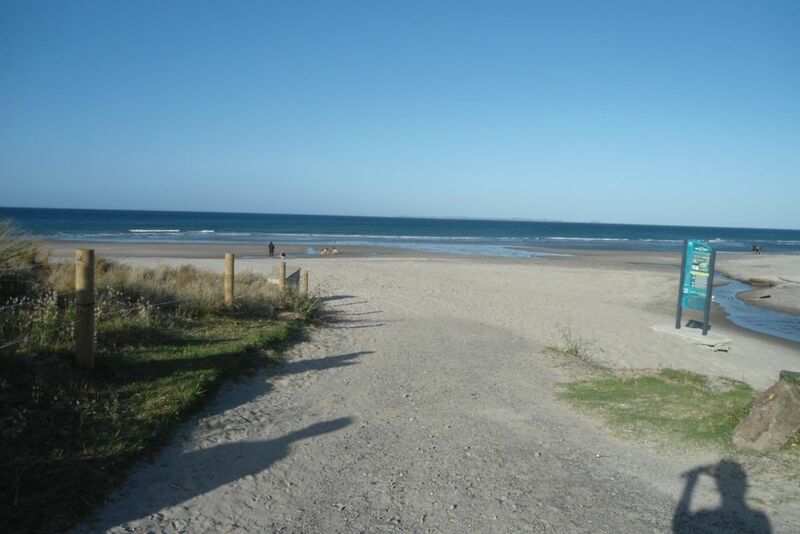 The most popular would be Papamoa Beach where if interested a walk to Mount Maunganui is possble at 10km. An inland walkway is available bordering flood lakes at the rear of many upmarket properties.